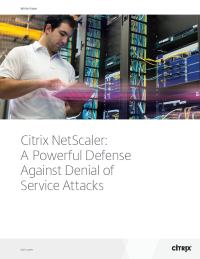 The Citrix® NetScaler® application delivery controller provides a robust yet highly affordable foundation for an organization’s DoS defenses. Download this white paper to learn more. Denial of service (DoS) attacks have made their way back into threatening today’s network and security operations teams, and detecting these attacks is harder now than ever before.